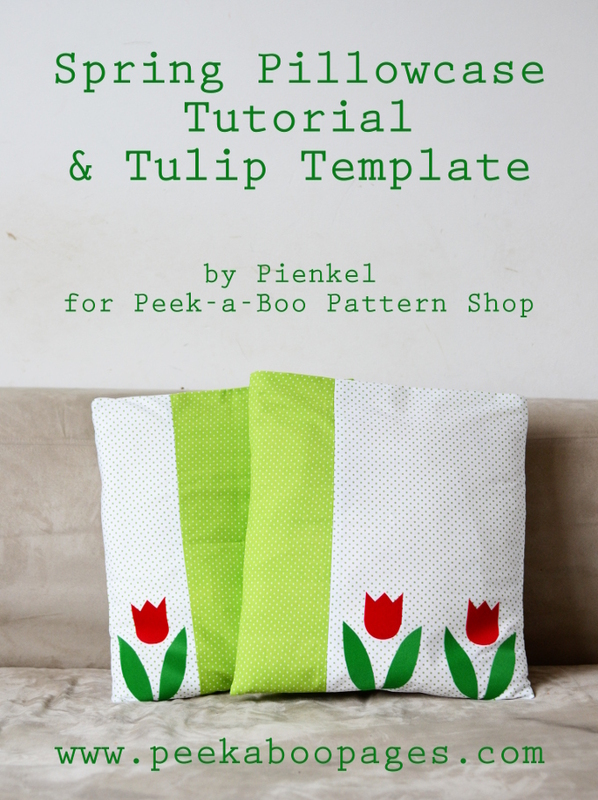 Tulip Pillowcase Tutorial - Peek-a-Boo Pages - Patterns, Fabric & More! Hi, it’s Nienke again, from the contributor team! Has spring kicked in where you live yet? Over here in Holland there’s definitely some spring in the air, daylight savings time has set in, grass is greening and the famous tulip fields are blossoming. 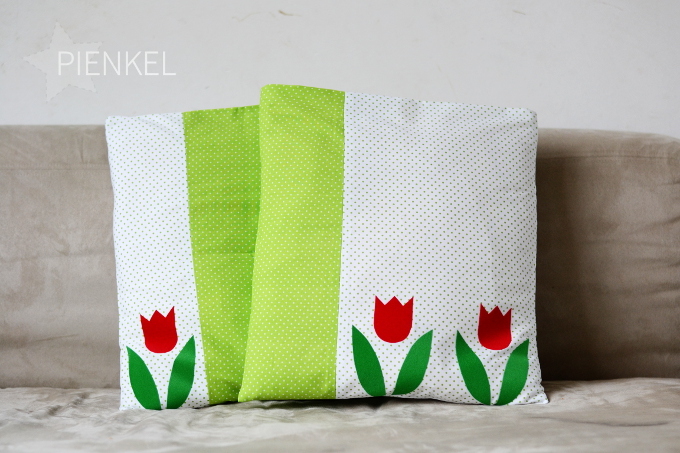 So, to bring some of that lovely spring atmosphere inside our home, I made colourblocked pillowcases, embellished with tulips in flock foil. – Fabric, two colours. Quilting cotton is perfect for this project. Don’t use knit or stretch! For two matching pillowcases, for 16×16″ pillows, you’ll need half a yard of each fabric, each colour cut into a rectangle of 6×38″ and one of 11×8″. – Flock foil, also known as iron-on velours, or heat transfer velours. If unavailable, you could use iron-on vinyl, or make an application. I used green and red. 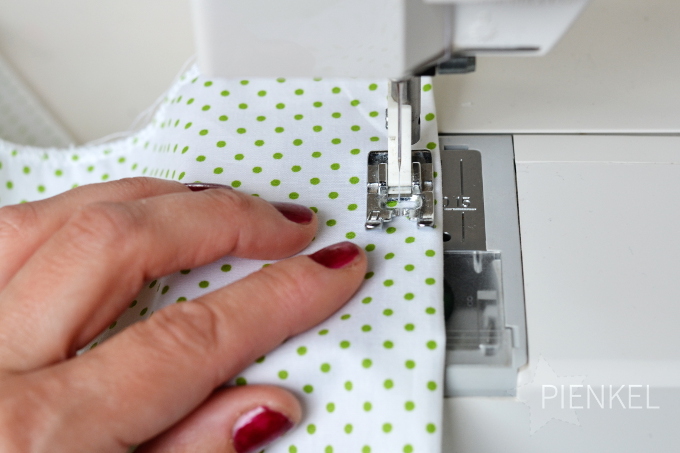 – Usual sewing notions: matching thread, pins, scissors or rotary cutter and mat, iron. – Tulip template. You can download this template here. Finish the edges of the four rectangles with a zigzag stitch or with a serger. Place a small rectangle on top of a wide one, the raw edges of one long side matching, right sides together. 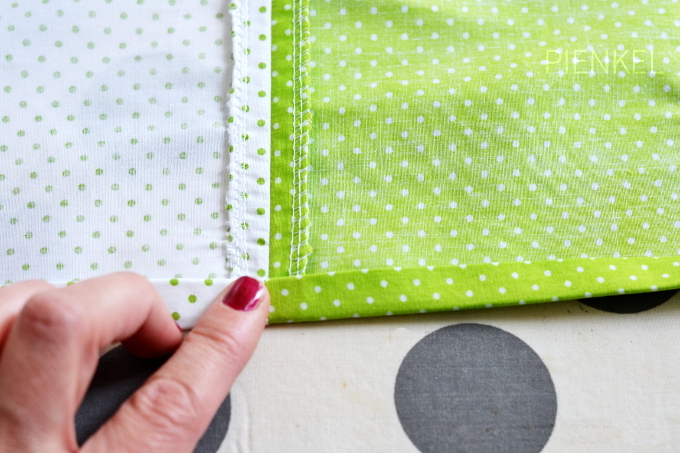 Pin into place and stitch with a straight stitch and a 3/8″ seam allowance. Press the seam open. 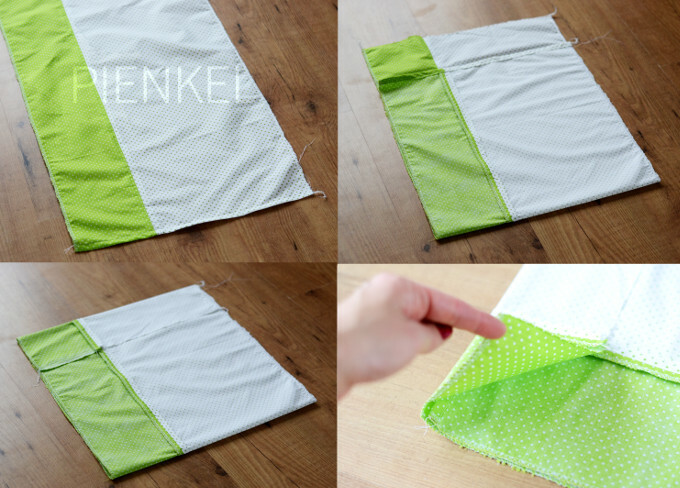 Hem the short sides of this new rectangle, by pressing the fabric towards the wrong side of the fabric 1/4″ as pictured above and consequently another 3/8″ as pictured below. Pin into place. Stitch the hem with a straight stitch. Now you have a long, colourblocked rectangle, with one short end hemmed. To change this into a pillowcase, fold it as pictured below. First, place the long rectangle in front of you with right side up and the hemmed edge close to you. 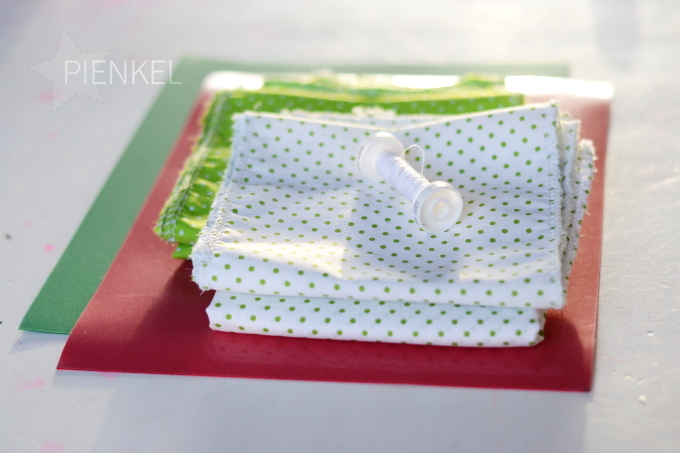 Then, fold the lower 16″ up, right sides together, sides matching. Lastly, fold the top flap back down over the two layers. 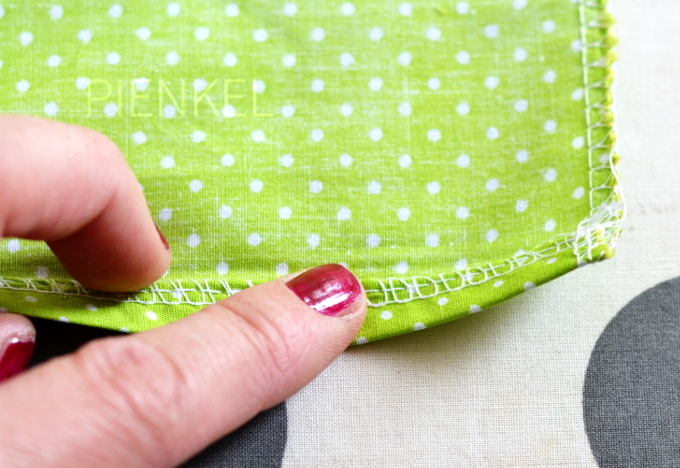 Make sure the fold of the top flap is neatly at the top of the hem, as pictured above. 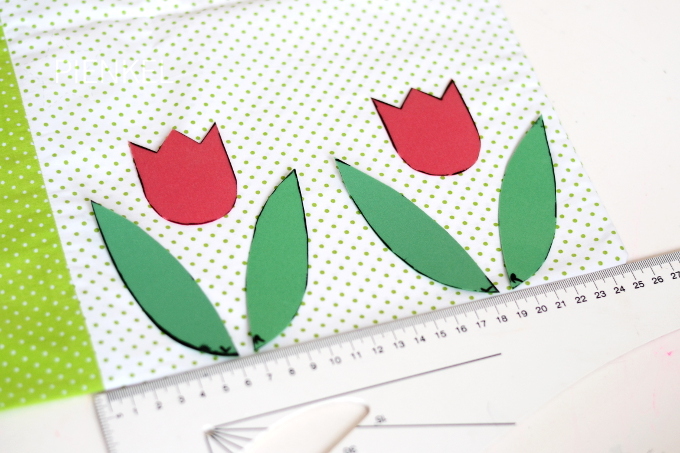 Pin the sides and stitch with a straight stitch and a 3/8″ seam allowance. Make sure to secure your stitching at beginning and end of the seam by stitching back and forth a few stitches. Turn your pillowcase and press. Repeat these steps for the second pillowcase. 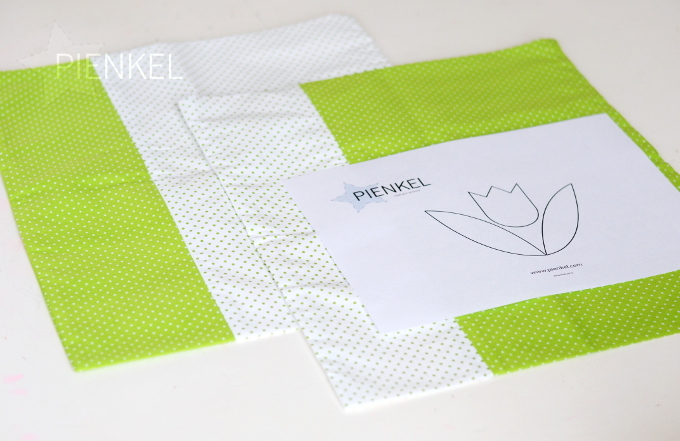 So, now you already have two colourblocked pillowcases that only need some tulips! 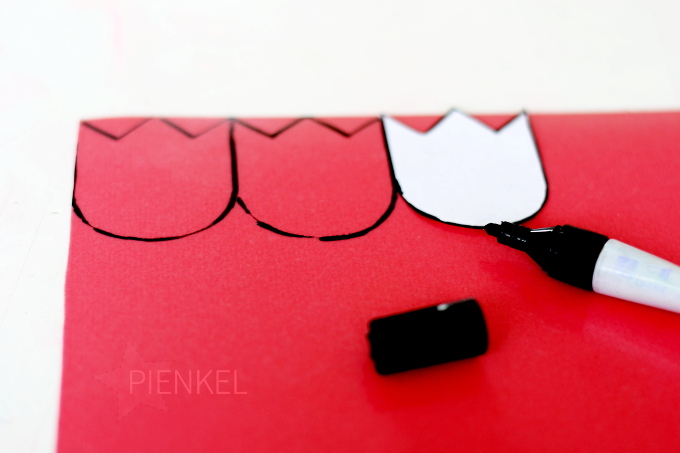 Cut out the template and transfer the shapes onto your foil. You’ll need three of each part. Since the leaves of the tulip are symmetrical to one another, but top and bottom are not similar, I marked the bottom of both left and right with the corresponding letter. Different brands of iron-on material may have different ways of applying. Mine has a glued downside and a plastic top coat that will be removed in the end. Therefore, I transferred the template with a regular marker and didn’t need to be very careful in doing so, since the marks will only be on the plastic that gets removed. For my foil, after ironing and letting it cool, the plastic top coat can easily be peeled off. Afterwards, I give it a quick iron on the back side. Don’t iron directly onto the front though! The first one is done! 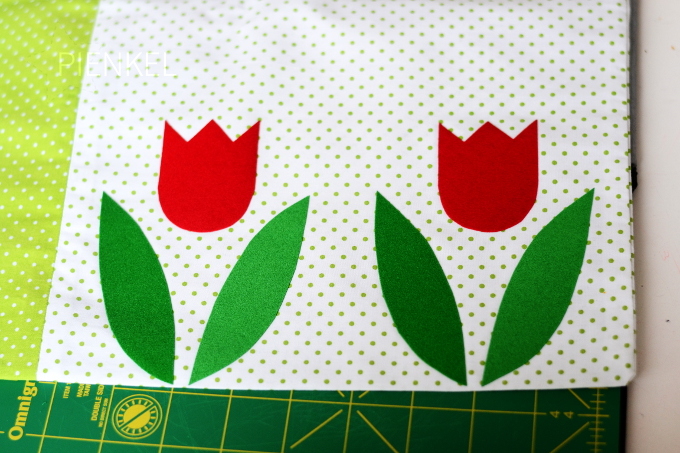 On the second one, I used only one tulip and positioned this on the small colourblock. Enjoy your mini tulip field!